When we say someone plays a lot of instruments it usually doesn’t mean playing them at the same time. Unless it’s Rahsaan Roland Kirk (1935-1977). But this wasn’t a street performer gimmick. Rahsaan was a legend, a prodigiously talented jazzman, an inspired and soulful performer, a one man reed section, and a tireless innovator, adapting not only music but also numerous musical instruments (many of them rare) to his needs. He was also a poet, a dreamer, an impromptu stage comic and political ranter. Rahsaan often played with the greatest of the greats. For a sampler, here is Rahsaan with McCoy Tyner (piano), Stanley Clarke (bass), Lenny White (drums), and Quincy Jones (emcee) at a Downbeat poll awards concert in 1975. Our faithful Wikipedia offers a commendable entry that follows Rahsaan’s life and assesses his music and legacy. Theodore Ronald Kirk lost his sight at an early age because of bad medical treatment. He was prompted in a dream to switch the “n” and “l” in Ronald, and later, in another dream, was induced to drop the Theodore, and adopt “Rahsaan” instead. Kirk played and collected a number of musical instruments, mainly various saxophones, clarinets and flutes. 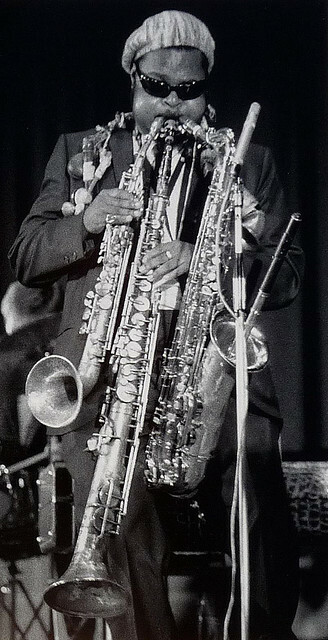 His main instruments were tenor saxophone supplemented by other saxes, like two obscure saxophones: the stritch (a straight alto sax lacking the instrument’s characteristic upturned bell) and a manzello (a modified saxello soprano sax, with a larger, upturned bell). A number of his instruments were exotic or homemade. Kirk modified instruments himself to accommodate his simultaneous playing technique. Yes, folks, Rahsaan played stritch, manzello, and saxello. You can hear it at 6:42 in this clip. The soul postlude that starts at 15:47 is also one of my favorite vamps. This entry was posted in funny names in music, Uncategorized and tagged music. Bookmark the permalink. Pingback: BoFN Contribution | What Do You Do for an Encore? What sort of amazing creature is this? Circular breathing? Goodness. That first pic is brilliant, although his cheeks make me nervous, like Dizzy Gillespie balloons about to explode. Who knew your dreams could tell you to switch out letters in your name? Roland would have been just dandy! In my ignorance, the only thing my mind associates with that last video is Will Ferrell playing jazz flute on “Anchorman” LOL. I haven’t seen Anchorman yet, but I heard it’s good. Yeah, I tried circular breathing and all I did was hyperventilate. But I do that anyway, so I got nowhere. What a talented man! Thanks for this. Truly informitive.